On July 21st, 2007, I stood upon the sales counter at the toy store Barstons Child’s Play. It was 11:45 at night and I was cloaked within a witches robe. I was performing a dramatic interpretation of J.K. Rowling’s Harry Potter and the Half-Blood Prince, the sixth installment in the series. As I performed the dialog between Professors Snape and Dumbledore, I looked into the glittering eyes of the hundred plus customers who crowded every isle of our tiny store. Then it was midnight, my performance ended, and the crowd grabbed the new book: Harry Potter and the Deathly Hallows. They had been on our pre-order waiting list for over two months and eagerly awaited their chance to begin the book. We locked the doors and the staff and customers melted into the inky summer night. Fred and I read Harry Potter and the Deathly Hallows very rapidly, mostly reading for plot. Years later after Fred’s death, I would read it again. It was an amazing book, and dealt so very well with immense journey one undertakes after the death of a loved one. I suppose that is very understandable as J.K Rowling based a lot of Harry’s journey on her own experience with grief after her mother’s death in 1990. Yes, Fred and I had waited eagerly for book seven. But that was not the only book we were waiting for. In October 2005 George R. R. Martin had published A Feast for Crows, the first in a two-part installment. The second part A Dance with Dragons was supposed to be published in the summer of 2007. Harry Potter came and went, and still we waited for A Dance with Dragons. And so passed 2007 and 2008 with no new book. In 2009, Fred became very sick with kidney cancer and though he got to read the not yet published Stephen King’s Under the Dome, he did not get his chance to read A Dance with Dragons. Just days before his death, he was still venting his frustration that George R. R. Martin had failed him in this. And so it came to pass that this July 2011, both the long-awaited second part the film Harry Potter and the Deathly Hallows and the long-awaited A Dance with Dragons became available for viewing and reading pleasure of their dedicated and enduring fans. And as I read A Dance with Dragons, I thought of Fred and the ceremony of bread and salt. The ceremony of bread in salt is an ancient one that is part of the mythos of George R.R. Martin’s Seven Kingdoms and our own world today. If you visit Slavic countries you will still see this ancient custom of hospitality. For if I eat your bread and salt I am safe with you and yours and we have a pact of truce between us. No one would violate such a hospitality pact, without risking the wrath of God. So within this reverie of reading, I received an email from another kingdom asking me to speak. The email came from Louise Schaper PhD in Australia. 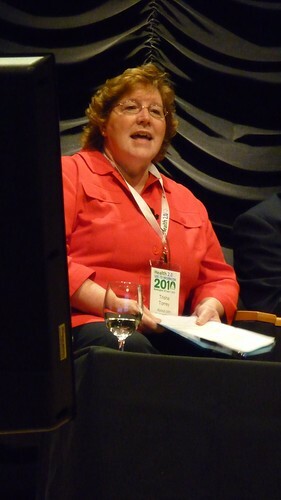 She is CEO of the Health Informatics Society of Australia. She said “About 2 hours ago I watched a TED talk by "e-Patient Dave" deBronkart and he mentioned you in his presentation. 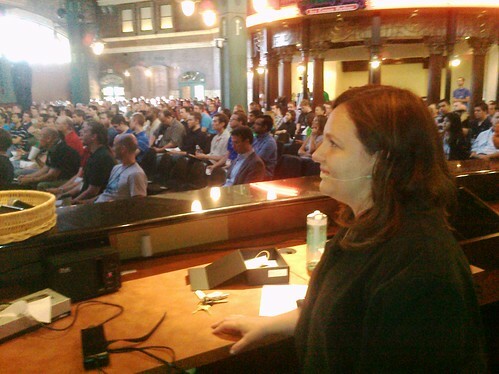 Thanks to the wonder that is Google, I have now perused your blog, subscribed to your twitter feed and watched your talk at the Cerner event last year.” She then asked me if I would be willing to speak at their event on August 1-4, 2011 in Brisbane, Australia. I said that I was so sorry but would not be able to attend this year, but would love to next year. 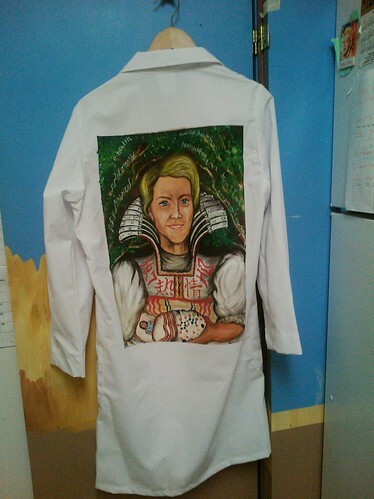 And I said I would paint her a jacket so she could join The Walking Gallery. This is Louise Schaper’s jacket: HIT Passion: Bread and Salt. Louise told me a little about her personality and her passions. She is a self-admitted geek so I hope my wrapping her story up within a tale of myth and fantasy is acceptable. I saw her as the maiden in a tale. I saw her as a participant in an ancient rite. She is dressed in a modified Slavic gown. 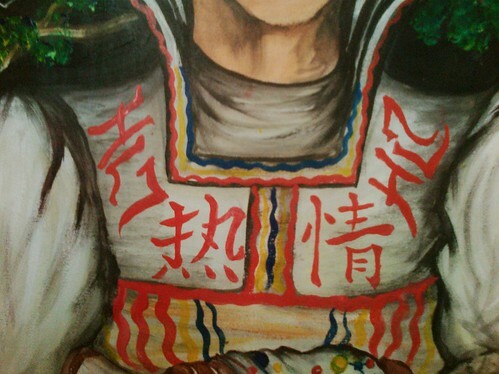 Upon her breast is embroidered HL7 as well as the Chinese characters for passion. For Louise is passionate about informatics and data access. She told me of how even as a youth she had an analytic mind and loved typing crisp rows of information using her electric typewriter. So Louise’s collar is set in type within this image. 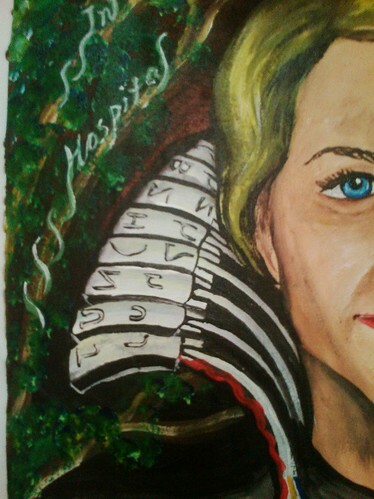 Behind her is a dark forest wrapped in letters and words like e-health and occupational therapy. She comes out of that forest to offer us welcome. She is carrying a loaf of bread. But instead of a hearty loaf of homemade bread, this is a plastic wrapped loaf of Wonder Bread. The bright dots of color upon the packaging form the structure of penicillin. Sandwiched within the slices is a dying patient. Louise’s cousin died while under anesthesia for a routine procedure, because the team that cared for her had no idea that she was allergic to penicillin. This is the kind of thing that should never happen. This is a breach of the laws of hospitality. This is the kind of horrible never event that EMR systems are designed to prevent. And so within my mind Louise represents one of the most important elements of the Game of Thrones book series: You do not kill the guest you have shared bread and salt with. And Louise is passionate that it should never happen again. And Louise knows the sorrow of J.K. Rowling and Harry Potter. Sometimes we lose the ones we care for even though we dedicate our lives to that which is right, rather than that which is easy. The month of July 2011 was a good month for geeks. We saw the last film of Harry Potter, we read the next book by George R.R. Martin, and many a self-admitted nerd made it Comic-con arrayed in their full Cosplay glory. As they walked the streets flying their freak flag they did it with their peers. Louise is wearing this, to a conference of her peers as the only Australian Member of The Walking Gallery. Thank you Louise for being brave and for being passionate. 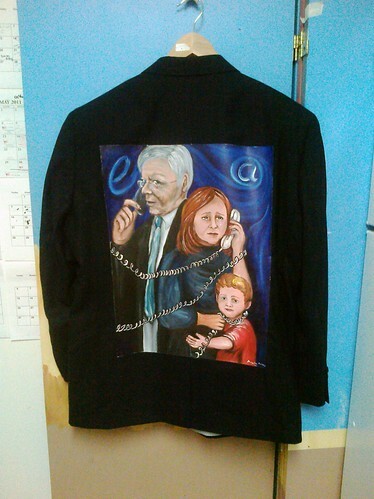 It was the day before The Walking Gallery and I still needed to paint 15 jackets. On evening of June sixth my apartment was in total disarray. I was painting in the kitchen. My friend Courtney Mazza was painting in the living room and children were running back and forth occasionally screaming for toys. In the midst of this chaos, I heard a knock. I thought might be the take out we had ordered, but no it was Bob Filley, Anita Samarth’s husband. 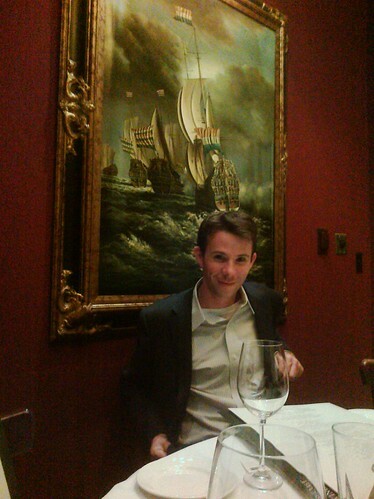 He currently works in Commercial real estate, but he majored in fine art. He had offered weeks before to paint, and here he was in the 11th hour. He stood before me in the hall wearing a nice suit and lovely cotton shirt. Behind me the room erupted with the jealous squeals of small children. It was amazing. Have you ever scene that scene in a war movie where the bullets seem to be flying by the hero in slow motion while he bravely soldiers on unfazed by his surroundings? That was Bob. And he painted such a joyous Dave. This is Dave De Bronkart’s Jacket by Robert J. Filley. I love this jacket. 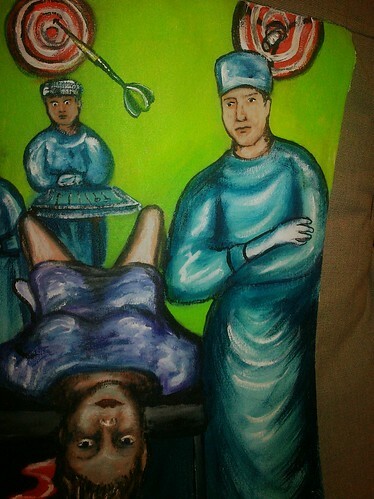 Bob filled the back ground with a series of descending kidneys. He then began using sunshine tones to build up the smiling visage of Dave. 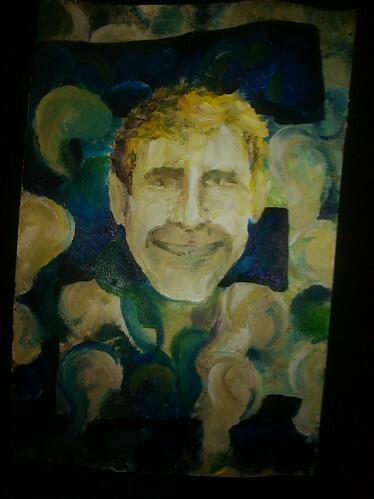 Using a wet into wet technique often used by oil artists, Bob built layer upon layer of wet paint into the shinning countenance of e-Patient Dave. 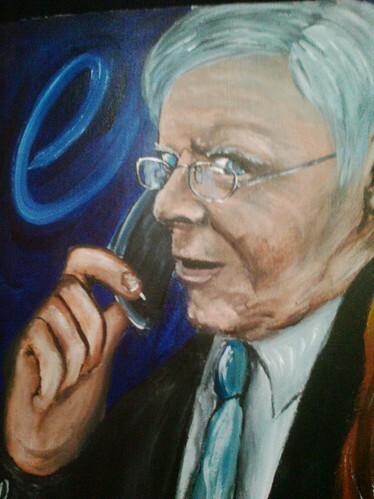 He then worked a deep blue capital “E” into the background of the piece. Upon my table lay a piece of impressionistic fine art. Bob finished Dave’s painting looked up and said “Next.” Bob would finish two more jackets, before succumbing to exhaustion later that evening. 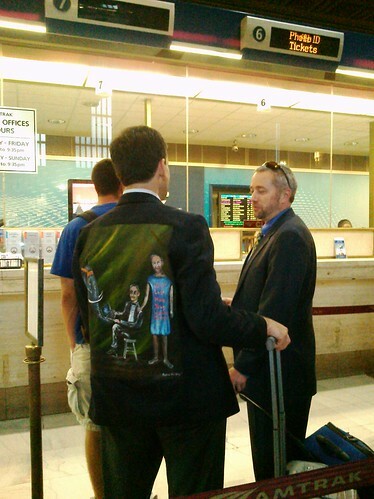 Dave loved the jacket and l wore it throughout The Walking Gallery. 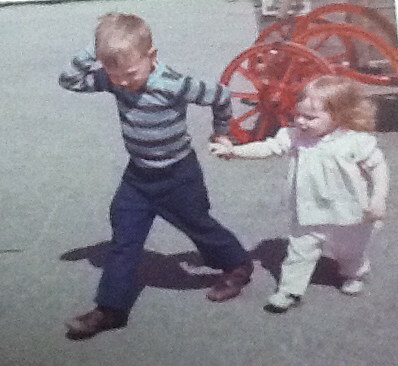 But Dave and I go way back, and often it seems our stories are twined one within the other. 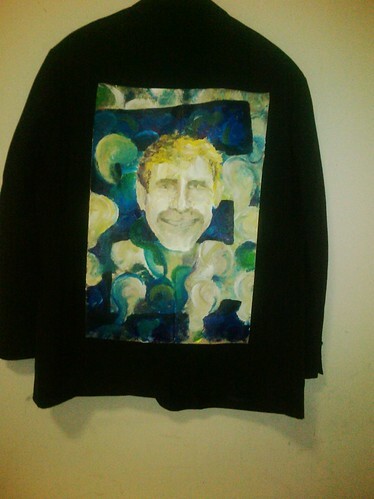 So, I painted Dave an additional jacket. I met e-Patient Dave on May 4th 2009. I went on Twitter for the first time on May 3rd, and wrote my first tweet: “I am trying to talk with Christine Kraft and epatient Dave.” By the morning of May 4th Dave had found me. He sent me emails throughout the day as we exchanged details of my husband’s cancer care. Within each missive he seemed more and more concerned. By that evening, I was talking with Dave on the phone. By that night I was speaking with Dave’s own oncologist. It was such a sad night. As I talked with Dave I was making macaroni and cheese for dinner. My three year-old Isaac was constantly wrapping his arms around me as I cooked and tried to talk. The poor little boy he was so starved for time with Mommy in this the eighth week of his father’s hospitalization. That was an important night. That night I learned about the term e-patient. I learned about ACOR (Association of Online Cancer Resources). I had been doing research for eight weeks but had never found ACOR. I would converse via email with the list founder Gilles Frydman and would see post after post from people across the world fighting kidney cancer. And I learned from Dave’s Doctor that soon it would be the end, sometimes there is nothing that can be done. Sometimes it is too late. So much happened on May 4th 2009. I stood within a kitchen wrapped within a cord of old technology whilst embracing the new. I became an e-patient. The weeks would pass and Fred would die, but I have never stopped talking with e-Patient Dave. We are twined together because of Kidney cancer. His story is light and ours is dark. But both stories are so very important. So Dave has two jackets: one light and one dark, because to create great change within the culture of medicine we have to accept them both. Not long ago Dave gave an amazing TED speech and it caused a lot of ripples in patient advocacy circles. 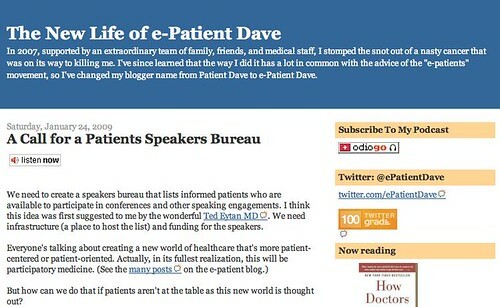 A few of those who felt those ripples emailed me and told me, "You should really meet this guy called e-Patient Dave." I chuckled and said, "I have met him. We go way back." I met Michele Behme because of HIT. She was the newest employee of Clinovations and wanted to be part of the Walking Gallery on June 7th, but I did not finish her jacket before the show. So the jacket sat within my closet until today. 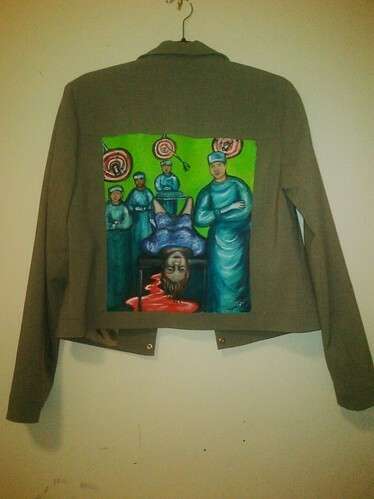 Over the weekend a fellow patient advocate named Jeni Dingman asked me to paint a jacket in honor of Patient Safety Day 2011. I thought Michelle’s jacket could tell the tale. This is Patient Safety Day: Michele Behme’s Jacket. 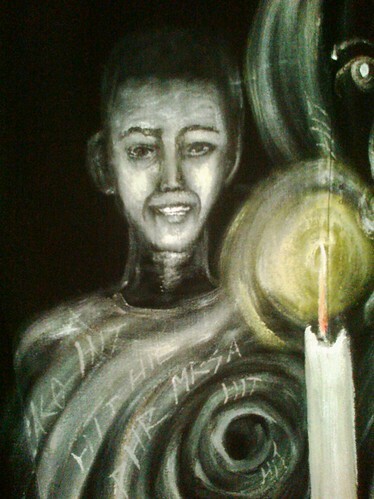 There are only two things within this painting: a candle and smoke. The candle shines as a solitary light representing what we have lost. The candle stands apart like a letter “I” asking each one of us a question. “What do we intend to do to make this system better? Then there is the smoke. Simple smoke rings blend and morph into four children within this piece. We see Justin, Josie, Taylor and Michael. They are only children and their prior experience with smoke consisted of seeing its tendril remains waft from their birthday candles. In the case of Josie and Taylor they would only ever have one birthday candle. Michael would get to have two and he probably ate cake as well. And Justin would be blessed to see 11 birthdays. So smoke was the memory of a day of cake, ice cream and presents to these gentle souls. Four beautiful children and now they are only smoke. Every one of them died due to a medical error. So we light candles and we remember. And we stare at smoke. 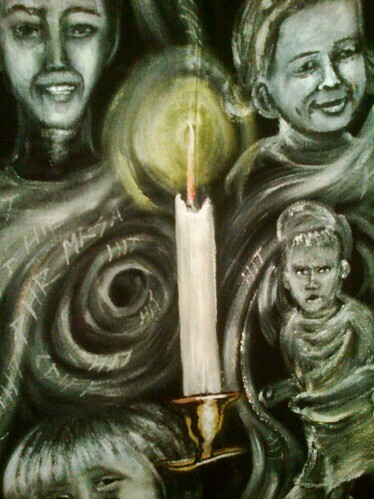 If you look closely at this piece you will see a figure embracing these children. She is made of smoke and letters. 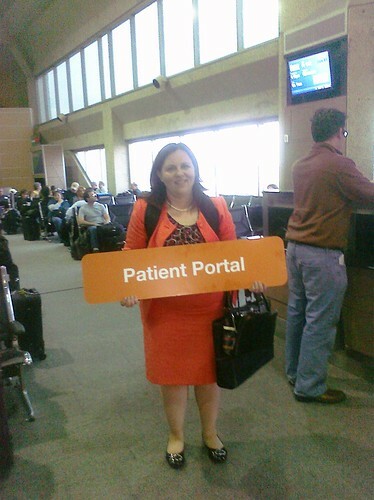 She is EHR, EMR, HIT: all the things that Michelle works with to help us receive better care. And she also MRSA, HAI, and C-DIFF, she represents the kind of infections that can strike us down. It is hard to tell the intent of this creature. Does she hug the children close in loving comfort? Or is she stealing them from us? Today is Patient Safety Day. 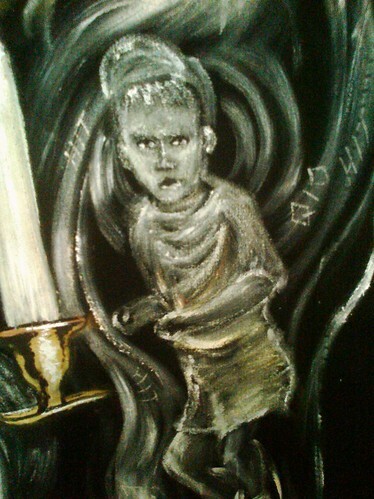 But yesterday was Church, and as I sat upon my pew I watched the acolytes light the candles. Unbidden to my mind a vision came. I thought of my wedding ring and Fred’s wedding ring. Why think of that within the pew? These past two years those rings have sat within a cabinet. And then the children scampered to the front for children’s sermon and Pastor began to speak of Wedding Rings. I gasped quietly and listened to Pastor talk of rings and weddings. This week I spent hours on the phone with some of the great minds working within patient advocacy. I asked them a series of 17 questions. Designed by the wonderful staff at TMIT (Texas Medical Institute of Technology), these questions are helping to create the nuts and bolts of an online vetted registry of Patient Speakers at a regional, national and international level. by Jessie Gruman. I must admit I was rather taken aback as I follow Jesse on Twitter and she has always supported patient empowerment in the past. 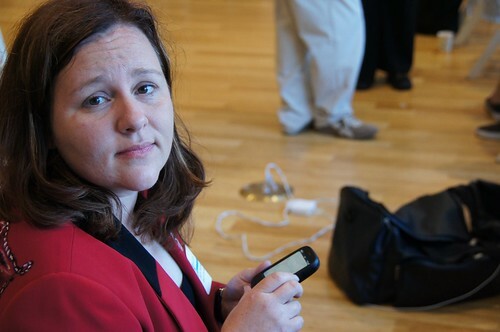 Jessie Gruman is the president and founder of the Center for Advancing Health. Its mission statement is: "CFAH conducts research, communicates findings and advocates for policies that support everyone’s ability to benefit from advances in health science." So, I was feeling rather stabbed in the back by being called a fly, and not just a fly, but also a dead one spoiling a perfectly good ointment. Jessie had decided to use a slightly incendiary tone in order to promote debate. For within her post discussing the testimony of patients before the Food and Drug Administration regarding the drug Avastin, was a critique of the power of the individual patient voice in relation to the combined power of evidence based medicine and governmental regulation. The patient voice can be a very powerful tool. Some may see a patient speaker as a Mayfly: here today and gone tomorrow. They may see us as the current tale of sorrow to be trotted upon the stage and then fall into obscurity. Or perhaps we are viewed as the buzzing fly. The persistent drone of patient advocate babble in the background at a meeting or at a conference, not important just a nuisance. But what does it mean to be called a fly in the ointment? Well, that’s Biblical. That means we have disturbed and defiled the sacred anointed oil of medicine with a corpse. And then I realized the true power Jesse’s title. For my fly is Fred, and Helen Haskell’s fly is Lewis, and May Ellen Mannix‘s fly is James, and Leslie Boyd's fly is Mike and we are disturbing the ointment. We fly throughout the nation as patient speakers trying to change the status quo from a profit-driven model of care to a patient-centered model of care. And we form a powerful group, that combined can support evidence based medicine by aggregating our shared stories. But before you can use our knowledge, you must be able to find us. And once you are able to find us we must be paid based upon our experience, depth knowledge and quality of our speech. This is a concern Dave DeBronkart, other wise known as e-Patient Dave, has been writing about since January of 2009. That is the reason we are creating a Patient Speakers Bureau. The decision to create such a resource was made after a conversation I had with TMIT CEO Charles Denham, MD. He asked me what did I see as a necessary next step in patient advocacy. I told him we needed a patient speakers bureau. In the patient advocacy community we have been talking about this need for a number of years. My frustration at the lack of such a resource reached its pinnacle as I did dishes one Saturday. I received a phone call from CMS (Centers for Medicaid/Medicare Services) asking which speakers would I recommend for an event in Texas. I was in my kitchen in Washington, DC doing dishes as my five year old played with toys upon the floor, and I was the resource for CMS to find a speaker in Texas. I thought there must be a better way. I knew there were amazing people throughout the country who could speak on a host of patient advocacy topics and do so from the perspective of a patient. I knew some of them. And Dave De Bronkart knew some of them. And Trisha Torrey knew some of them. And Charles Denham knew some of them. If you knew Dave, Trisha, Chuck or Me, you could ask us for our lists. But that is very cumbersome and it feels like we are constantly re-inventing the wheel. The beauty of an internet resource is that it advocates 24 hours a day. And try as hard we can to keep going, human advocates must sleep. I asked the advocates what websites did they use and what feature was the most important. By far and wide, the advocates were focused on a using a good search function. They also loved data filtering and aggregation. They thought the ability to have communication within a community was important as well. If you have a cause you must be on Twitter. Which social media sites do patient advocates use? They listed Facebook, Twitter, Linkedin, Meet-Up, Slideshare, Google +, Blogger, Wordpress and Posterous as important tools in the patient advocate toolbox. Unlike many speaker bureaus, we are focusing on promoting the speaker with a well-rounded advocacy platform. The speech is not an end unto itself, but instead a beginning. Most of these speakers blog and have an astute command of social media that will allow the concepts of the conference echo for weeks, months and years on the world wide web. Indeed, hiring a speaker from those listed on this portal can increase the digital footprint of a facility often faster than is possible with their in-house social media team. One of the benefits I often attribute to hiring a patient speaker or inviting them to attend a meeting, is the benefit of the one-person view. Often organizations become so multifaceted and constrained by the will of the group they become handicapped in their ability to present the individual patient view. I found it very interesting that many of the advocates I interviewed present themselves across every social media platform as themselves, seamlessly blending professional and personal lives. The only exception was Facebook . In about half of those interviewed they said their Facebook usage was more for friends and family with far less professional messaging. I do not look for them; they find me. I asked the speakers if any of them had experience with other speaker bureaus. Most responded that they had little experience with such sites. Some had visited the Washington Speakers Bureau, NAMI, Alzheimer’s Association and SpeakerGram. Most of the advocates had never used such sites and relied exclusively on word of mouth to promote their speaking advocacy. If we build it, will they learn? I asked about any thoughts the advocates had on continuing education on patient topics and in patient speaking. I also asked in what format should we teach such topics. The advocate pool said text based information was a must, interspersed short video and audio clips. They also said a webinar element both live and archived was important. The stressed the need for small group interaction and self-directed learning. We also queried the groups about two planned courses: “A Crash Course in n Public Speaking” and “Narrowing your Speaker Topic.” Those surveyed said they would be very interested in such courses and would like other concepts as well. They were interested in learning about their audiences, understanding national patient advocacy strategy, and wanted to see great speeches. Requests were made to learn how to better harness presentation tools like Power Point, Keynote, and Prezzi. Most responders thought a best speeches segment and “What not to do" presented in a short video format would be well received. We wanted to get a gauge on which organizations were currently inviting patient speakers and found out that there was a wide range of venues. Many of the advocates had spoken before RWJ Foundation, IHI, HIMSS, HealthCamp, and Health 2.0. They had spoken before hospitals, Quality Care Organizations, Beacon Communities, Legislatures, White House Initiatives, Medical Insurers, Therapy Groups, Medical Schools, Data Users Groups, Social Service Agencies, Venders and Medical Conferences. Patient speakers were beginning to show up at many venues. And like any good fly on the wall they were listening for more opportunities to spread the word, often handing out piles of business cards at each engagement. They also were utilizing their social media contacts to disseminate the information gathered at each venue to spread across the many silos of thought and culture. As patient advocates are viewed as more than a one-off story, their stature changes to that of a professional patient speaker. Within this transition, a speaker goes from speaking without recompense, to speaking while receiving honoraria, to a point that their participation has become so valuable that they are working under a speakers/lecturers contract. Many speakers are doing their advocacy speaking with little business support; I asked our pool if they would be interested in guidance and help within the world of invoicing and contracts. Almost uniformly the survey respondent requested help. Many wished to know current appropriate pay scales, and asked questions about tax liability. Suggestions on bookkeeping, fee negotiation and how to deal with delinquent payment were also very much on the mind of many of the advocates. We asked speakers to consider what would be the most important elements of their speaker profile. Several of the speakers said they were not interested in a linear format of information, but said the key elements were: Name, 3 Topics, Contact now, Photo, testimonials/Patient Story, audio/video, slideshare, website/social media, location, Bio/short CV, honoraria/speaker fee, contact email/phone and a yelp-like ranking system populated by organizations that had hired said speakers. The group cautioned against video only, as video is blocked at many facilities. Likewise some recommended imbedding a Twitter feed vs. a hot button link to twitter as social media sites are blocked at many institutions. They strongly encouraged the ability to rank speakers. Some speakers encouraged designing this site to work on smart phone platforms as many of those researching speakers may have to use their personal devices to view blocked video. I asked those surveyed if we could feature speakers on the landing page how should that be done. This question had very divided answers. Some thought it should be completely random, some randomized with priority, some based on audience interest using analytics, and others thought it should be based on trending interest. I asked how should these speakers be marketed and how should we promote the site. The advocates responded overwhelmingly that they would market themselves and the others in the portal using the tools of social media, during their own speeches and while networking at conferences. They said they would like it if TMIT would help promote, but they would use their passion, connections and grass-roots activism to promote as well. As far as creating awareness for the site itself, they recommended a press release, emailing all contacts, partner with consumer organizations and populate the site with an exclusive list of vetted speakers. They also recommended using technology to create widgets to imbed on sites that support our mission, tag and link back through our blogs and enable a comments section. Like any good parent who has been thinking of the upcoming birth of their child, we have been concentrating in the design and care of our site. But it also must have a name. We could call it many names, but the most popular were along the lines of Patient Speakers, Patient Speakers Bureau, and The Patient Voice. It was great to talk with so many wonderful folks during this process. And I would be very interested read your thoughts in the comment section. I think we are on the brink of cultural shift on how we view patient participation within medical care on a local and national policy scale. I am glad I met Chuck Denham and the other great folks at TMIT who are realizing a dream that many of us have been hoping for these past years. I am glad this portal can be part of that, and am proud to be a speaker as well as the “painting fly” upon the wall. I cannot help but wonder how different our lives would be if this portal was around five years ago instead. Would Fred have seen birthdays four and five as well? Memory is a funny thing. It can be so clear one minute and misty the next. And I can remember so many things of long ago. And as I go back to these first memories the things around me grow ever larger as I grow ever smaller. I remember a trip, to a place in the Ozarks, with water and the wishing wells. I am throwing pennies in wells. I remember my older brother grabbing my hand as I strayed too near the edge, and telling me not to drink the water, for he was six years of age and he could read the signs. Memory is a funny thing. And things that may not seem important are flash frozen within my mind, like that 2-liter of Pepsi. I see it bounce upon the clean linoleum floor of our mobile home. We couldn’t believe it. It was 1978 and we had purchased our first 2-liter of Pepsi. And it was just like in the commercials, these bottles bounced- they didn’t break like the glass bottles. And as my little arms lifted the heavy 2-liter off the floor, I marveled at the weight of it. So this is what two liters feels like. I remember the night I found my favorite fairytale. 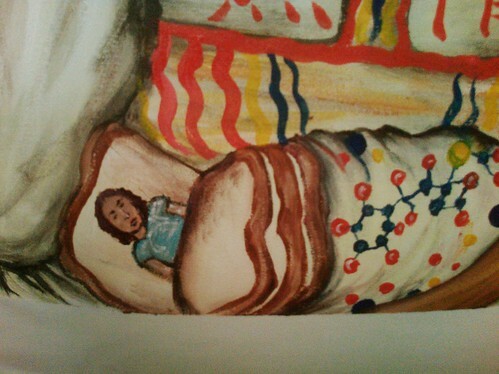 I was to sleep in the spare bedroom in My Aunt Hilda’s house. My sister and I were spending the summer with our spinster Aunt Hilda and our widowed Aunt Minnie. We were far away from our loving Mother and a Father who should not spend long summer days alone with little girls. I found my Aunt’s collection of Junior Classic Fairytales published in the 1950’s beside her sewing box. Between the green linen covers of one book I found a Grimm’s Fairytale: Mother Hulda. I love this tale. It was a tale of a young girl who must spin all day for her lazy stepsister and stepmother. She spins so much that she cuts her fingers on the spindle and covers it with blood. Her stepmother commands her to wash the spindle in the well. She tries to wash the spindle in the cool deep waters. Accidentally, she dropped it into the depths. She was filled with worry, but told her stepmother the fate of the spindle. Her stepmother tells her to jump in after it. Filled with despair she jumps into the well. Instead of splashing into the dark depths, she falls into another world. It is a beautiful world with blue skies, green grass and flowers. She walks a while and comes upon an oven full of bread. The loaves call out, begging to be removed before they burn. The girl removes the loaves. She walks further and comes upon an apple tree. The apples beg her pick them as they are ripe. The girl picks the apples. The girl walks even further and finds a cottage with and old woman inside named Mother Hulda. She serves the old woman for weeks and weeks. Mother Hulda rewards her for her labors by showering her with gold. The girl returns to our world, and her stepsister is jealous so she jumps into the well. She doesn’t save the bread and she doesn’t pick the apples. She does a poor job of helping Mother Hulda. 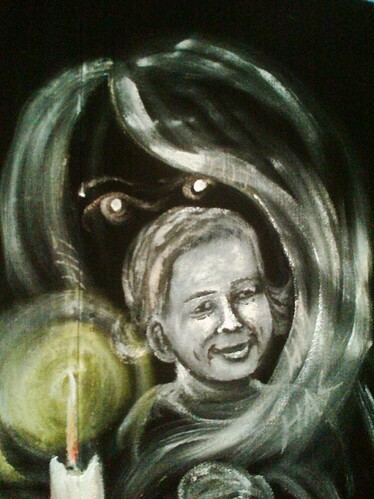 In the end, Mother Hulda covers her in tar. I loved to read this story in my bedroom at Aunt Hilda’s. It was unlike any other story I had ever read. And I was only ten. Memory is a funny thing. I don’t remember when I first heard of Helen Haskell. Oh, I can look back on an email thread and see her name for months before I knew her and what she represented. I remember in the fall of 2009 Lisa Lindell telling me about Helen’s campaign to make sure all medical providers wear clearly marked nametags as to who they are and what is their job. In the summer of 2010 when I was researching the painting “Give Us Our Dammed Data,” Helen gave me a list of potential authors for the piece. She is an amazing resource and advocate in the patient safety community. And as I got to know the story of Helen I got to know the story of Lewis: her wonderful son who died as a result of medical errors. And he was only fifteen. 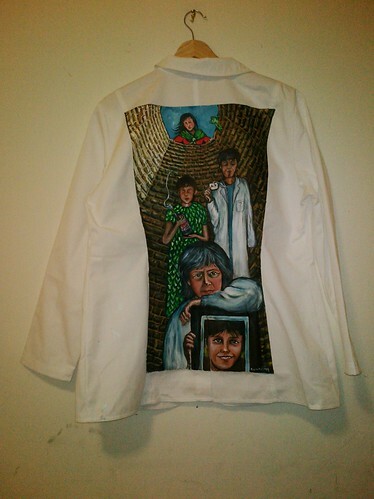 I wanted to finish this jacket in time for the Walking Gallery, but that did not come to pass. I look at these jackets in my closet, and I pull them out as the vision of what should be depicted flows freely in my mind. 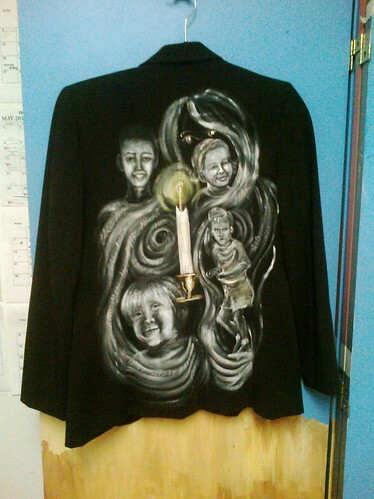 And when I see Helen’s jacket and read her son’s story, I feel like I am looking up from inside a deep well. Have you ever wished so hard, then threw the coin within? Have you ever prayed at night that this was just a dream? Have you, constant reader, stopped the tale and closed the book, before the bad thing happens? I know that nightly Helen and I gaze within the well. And one day when the pain became too much we jumped inside and became advocates. We landed on our feet in another world. And daily we pick the apples and save the loaves. We send out articles and speak at conferences. And Helen does it because Lewis should not have died. Lewis Blackman is in this painting twice. 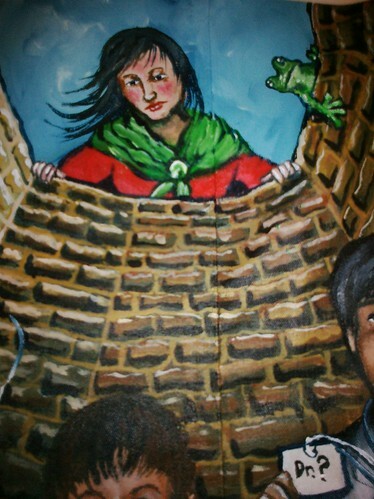 He stands within the piece as the boy in green tunic of Peter Pan. He is dressed as Peter because he will always be remembered as a boy. Did you know that the character of Peter Pan was modeled after the author J.M. Barrie’s 14-year-old brother David? David died when he was only 14 due to an accident. His mother grieved deeply for her lost David, and Barrie’s life was defined by this experience and it helped create his Neverland. These are things that should never have happened, these are tales that cannot be told without a wince or a gasp. 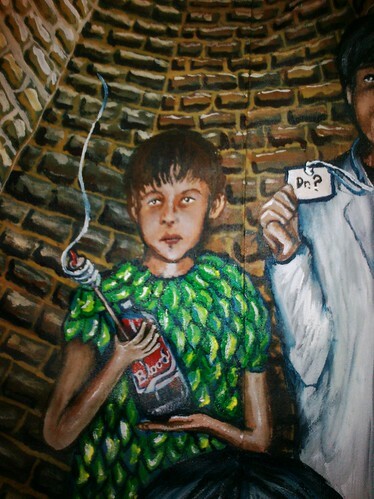 Lewis is holding a 2-liter plastic container in this painting, but it is not Soda. It is blood. And I think of the weight of that 2-liter, with all the memories of a child. Helen’s child laid in hospital his abdomen filling with three liters of blood as he died in excruciating pain. That memory echoes in the mind. Below and to the right, Helen clutches a picture of Lewis. He is happy within the frame in direct contrast to the deep sorrow on Helen’s face. Lewis was brilliant. Lewis was a scholar. He was on the fast track to attend Duke University and for his light reading while hospitalized he brought Dune and Julius Caesar. He went into the hospital on a Thursday, and his parents had no idea how dangerous a hospital can be on weekends. They had no access to see a medical record with a nurse’s note that “he was not producing urine.” They had no access to a medical reconciliation report that would have listed the dangerous side effects of Toradol, a drug that is diluted by urine flow. These were really important facts. These were data access points that could have saved a life. Lewis was given 17 adult level doses of a drug that ended up killing him within four days. All along Helen asked to see a Doctor. Instead residents working 36-hour shifts attended Lewis. She asked again and again to see a veteran doctor. Finally a man appeared that she thought was an attending physician, instead it was a chief resident. Helen didn’t understand this, as she did not see any nametag making his position nor experience level clear. She would spend years supporting legislative change in the sate of South Carolina that would require all doctors to wear identification tags. 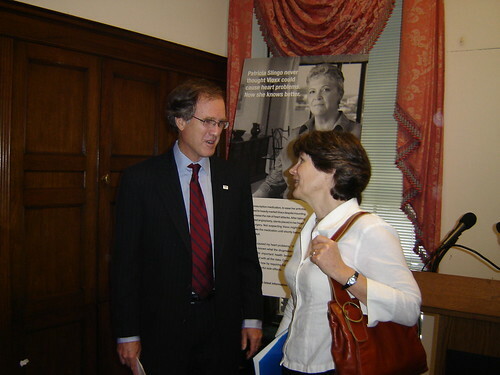 The Lewis Blackman Hospital Safety Act was passed due to her efforts in 2005. Above and looking into the well, is a frog. The frog looks concerned and braces its front foot against the inner lip of the well. Is this the frog prince? Is this that doctor who appears as someone they are not? Or is this the Leapfrog? Is this the refusal to accept the status quo; is this the deep desire to create a Never Event land? I am so glad I met Helen. In patient safety advocacy circles, she is often viewed as a mother to us all: the lady in the well of tears, the founder of MAME, Mothers Against Medical Error. We shall work so hard with her to create this new world of Never, Neverland. As a child I loved Mother Hulda. I loved her even though I did not know her other names: Holle, Hel, Hilda, Holda, the Goddess in three parts (Maiden, Mother, Crone), the Guardian of the Netherworld, the protector of children, the Goddess of the storm, the leader of the Wild Hunt. Mother Hulda waits at the bottom of the wishing well. First and foremost she is the Goddess of spinning. She is making a mighty web. And when I think of Helen, I think of this web, for Helen is spinning too. She is making a mighty web of advocacy that I am honored to be part of. For 12 years I worked at the toy store Barston’s Child’s Play on Connecticut Ave in Washington DC. Over the years I helped so many local folks. My customers included many of the great people I work with now, but then I only knew them as really nice customers. These days, I know them as Eva Powell at the National Partnership for Women and Families, Christine Kraft at Perfect Sense Digital, Claudia Williams with the ONC(Office of The National Coordinator of Health Information Technology) and Susannah Fox with Pew Research. 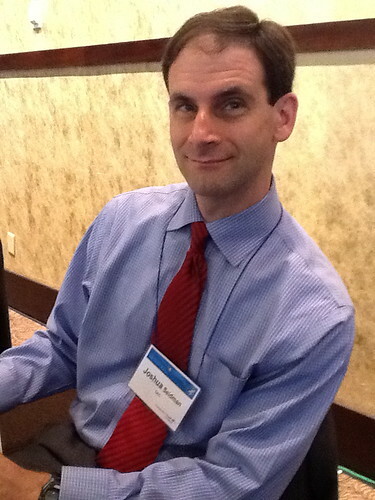 Another customer was Josh Seidman with the ONC who leads the Meaningful Use Division. Now, these wonderful people see me dressed in skirts and business jackets speaking on the stage, but once upon a time I helped them wearing old t-shirts, sneakers and jeans with holes in both the knees. There is a really good reason for the holes. At Child’s play we kneel to help you. We kneel constantly to talk with our young customers or to price product and display it upon our shelves. We even interview potential new-hires seated upon the floor. So when I see holes at the elbow or the knee, I know I just met someone who works. Someone who does hard physical labor. 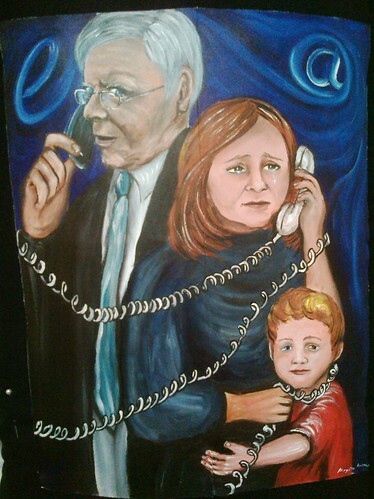 Last week, I had the honor to paint four jackets for The Walking Gallery while attending the 2011 Regional ONC Meeting in Philadelphia. I started with the one I brought along belonging to David Sides from Cerner. Then I cornered Anita Samarth from Clinovations, I got one of her jackets. Then I asked Josh Seidman for his. During a break he rushed back to his hotel room and brought down his spare jacket. 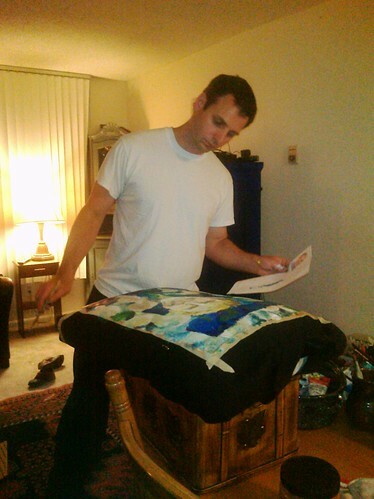 As I mounted the jacket upon the easel, I could not help but notice Josh works very hard. Both elbows had the tell tale holes left behind by long hours at conference tables. Yes, Josh labors on Meaningful Use often as a servant leader. He is quiet and thoughtful. His head is often ducked in thought, and he thinks so carefully before he speaks. I have presented twice with him on panels and he always has something profound to say. He maybe the Master of Ceremonies at Meaningful Use, but he is humble and his jacket has holes in the elbows and that means so much to me. But his story means even more, because Josh is a Father and Josh is a Son. And Josh knows in a very real way the power of patient and caregiver access to the Electronic Medical Record. 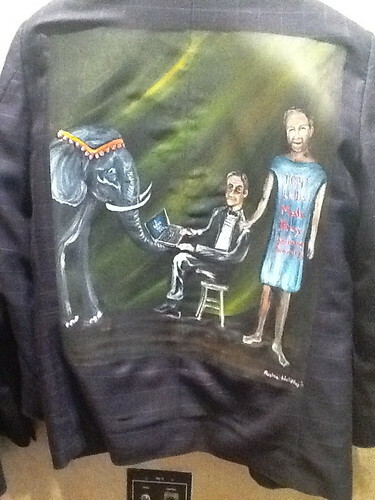 This is Josh Seidman’s jacket: Master of Ceremonies, Backstage at Meaningful Use and I painted this as Josh spoke on stage before the assembled crowd. about his long distance experience with his Father’s hospitalization. 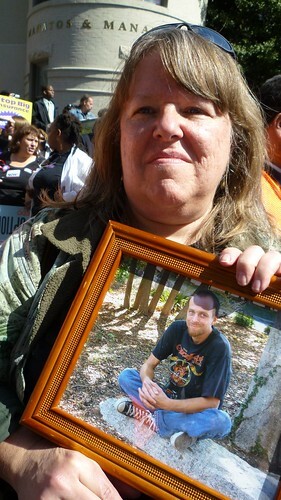 Josh’s father was admitted to the ICU 500 miles away in Boston. With consent, Josh was able to log into the hospital patient portal. He was able to view lab data, active/inactive medications, x-rays, cardiology reports, ECG’s and blood cultures. After discharge, Josh was able to view the discharge summary as well. The portal was not perfect, it could have been more user-friendlier, but it was access. And as I Josh can tell you, family members and patients suffer great emotional anguish if they have no access to timely communication during a hospitalization. Also, there were important pieces of information left out of the portal. There were no progress notes nor CT scan results nor any way to provide secure messaging to the care team. But the access that was available was better than being alone in the dark worrying. 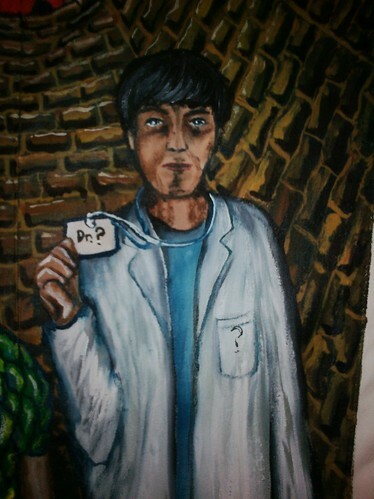 So in this painting, Josh is backstage and the curtain is drawn. He sits upon a circus stool. He is wearing the Ring Master’s uniform. He has a slight smile with tired eyes. He is working on a Laptop trying to access needed information. Beside him stands his father. Writ large upon his Fathers chest are the elements of his clinical record. 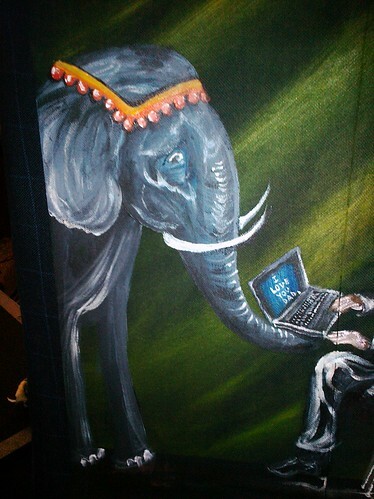 To the far left stands a circus elephant stoically, patiently supporting the laptop computer with his trunk. Here is the elephant in the room. 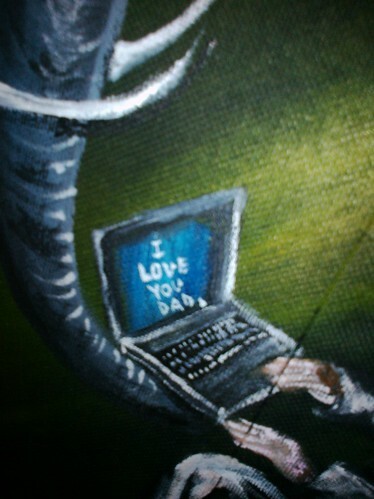 This is the emotional elephant that is such a large part of information access. But it is also the patient/consumer/caregiver as the elephant. You see, I could have written any clinical fact on this laptop screen, but I didn’t. 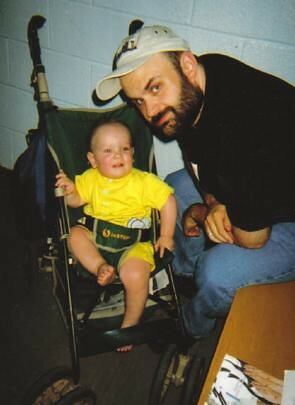 Because the most important part of timely access to the EMR was summed up in four words, “I love you Dad.” And that day Josh wasn’t the Master of Ceremonies of Meaningful Use, he was just backstage, part of the cast and crew sitting in darkness and praying for a little light. I saw Josh heading home on the slow train to DC. He was wearing his jacket. He was leading with his patient story. This is the true vision of patient participation. Thanks Josh for all you do. You help all of us who are wearing thin within our advocacy, by all you do and say to support the mission of the Patient Voice in Meaningful Use. If you have ever seen me paint, you are probably quite aware I don’t tend to sketch. I don’t believe in a do-over, and I do accept organic change within a piece. And so I paint, often on site, within a swarming crowd or upon a city street or at a busy conference. And I see them out of the corner of my eye: the watching ones. My peripheral sight warns my animal mind of impending attack or possible collaboration. My intellectual mind says all those reassuring things. “Don’t worry they are only watching.” Occasionally I will spin around upon those too close at hand. My nose slightly flaring, my eyes dilated. I see everything. The eyes are so important. Anyone who studies health and medicine must greatly depend on their eyes and the eyes of those they care for. They depend on their vision to accurately diagnose patients and to foresee impending problems. I remember Fred’s eyes before they closed forever. Such beautiful eyes, when they looked at me through love, I could fall forever in those black depths. And they were such scary eyes when they constricted as tightly as a python through a haze of opiates. Sometimes I focus on the scary eyes. And that phrase heard on television time and time again echoes in my mind: “Pupils-fixed-and-dilated. Pupils-fixed-and-dilated.” It rolls off my tongue, like letters recited by a child: “l-m-n-o-p.” It has been said so often together that it has become one word. But let us dissect this. Pupils fixed: not responding to light. Dilated that was nine days ago when Near Miss Mom gave birth to her baby. For this is a jacket story. And I want you to look into these eyes. This jacket is a story of birth and consequence: the telling assisted by a midwife. This is @midwifeamy’s jacket or as her local friends know her Amy Romano. I met @midwifeamy on Twitter on September 14th 2009. I enjoyed her tweets about woman’s causes and childbirth. She is a powerful patient advocate. I met her in real life about nine months later. 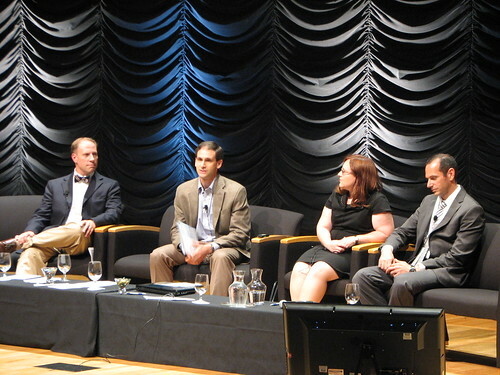 We were on the same patient panel at Health 2.0 Goes to Washington. I told Amy I would blog my birth stories sometime soon. But time and life got away with us and my Isaac’s story remained untold. You see when Fred went to the first hospital where we fared so badly, I was already familiar with it, as I delivered Isaac there. In January of 2006, I was trying to maintain my pregnancy. I had begun pre-term labor before Thanksgiving, and was carefully watching for contractions. My OB told me that as long as I drank water constantly and didn’t lift anything I should be able to make it to 36 weeks. In late January, I woke to find Freddie sick and I needed to go to my OB appointment. So I took the bus and then the train to my appointment, where I was told that I was beginning to dilate but had not dropped. I took the train and the bus back home to find Freddie running a 104-degree temperature. I called the pediatrician to make an appointment. They fit him in that afternoon and told us he had a bad case of the flu. While at that appointment I felt the contractions begin. So we drove across town to the OB, who determined I had dilated quite a bit more, so he recommended I go to the hospital. In rush hour traffic my worried husband and my sick little boy, drove me to the hospital where they deposited me on the curb. I waddled in the hospital by myself and went to stand in the line for submitting insurance information. After triaging me they said my blood pressure was too high to walk around as I had done in my last labor. I was told to lie on a gurney in the labor triage as they waited for a room to open up. After enduring few hours of ever increasing contractions with no relief via movement or distracting company, I was finally transferred to labor and delivery. I had already made it vey clear during the entire process I wanted natural childbirth. As I labored without my husband or a friend to advocate for me, I saw something from the corner of my eye. A nurse was doing something. I whipped my head around and asked, “What are you doing to my line?” She looked over at me nonchalantly and said, “I am adding pitocin to speed up labor.” “No, you are not!” I said. “I had my first son in five hours and I will have this one in less and don’t you dare touch my line.” She left in huff and I was once again alone in the room. Everything happened very fast after that. Fred finally arrived, as my mother-in-law was able to drive up and watch our sick little boy. Within thirty minutes my water broke and we had Isaac. His face crinkled in dismay at being born and Fred immediately said he looked like a little old man. Fred was right. Looking at Isaac was like looking at miniature version of my father. They took Isaac to the NICU, but he seemed to be doing pretty well considering he was barely 36 weeks. Fred looked at me lovingly and said, “I brought you something to read.” It was Stephen King’s book: Cell. I loved that book, and I agreed with its premise and thought I would never own a cell phone. The next day the NICU staff said they wanted to send Isaac home. He was slightly underweight with an elevated bilirubin. I was upset. His brother was a 102 degrees and vomiting. Our tiny one bedroom was completely contaminated. I had not even been allowed home yet to clean. The staff suggested we could always go to a hotel. I walked away and called the pediatrician’s office. A couple of hours later the NICU director told me, “I don’t know who your pediatrician is but she just tore me a new one. Your son may stay for two days.” I checked out and went home. I ate some take out, expressed some milk and then began disinfecting the apartment, as my mother-in-law comforted Freddie and my Fred went back to work. We brought home Isaac to a clean apartment and little Freddie wore a facemask for a few days to prevent infecting his new little brother. That was our birth story, and though it was fraught with frustration it does not compare to the story depicted on Amy’s Jacket for the Walking Gallery. Near Miss Mom almost died. She almost died after delivering nine days before because she almost bled to death in an ER. She waited for an MRI and bled. She waited for a pump to express her milk, and found there were no pumps in the ER. Her friend left her side to go to a local drug store to buy a pump. Then Near Miss Mom expressed and bled some more. She bled so much that it welled above her thighs and filled her sheets, twice, while in the ER. She bled so much it required 11 bags of blood to save her. And she was awake and realizing all of this until it was almost too late. And the last thing her eyes saw as she was going into surgery was the surgeon and nurses all lined up and staring at her. This is the story delivered to me. I had no pictures of the players, only Amy’s words to guide me. I began to paint and I focused on the eyes. Near Miss Mom’s eyes stare at the viewer as she is bleeding to death. Her face is serene, as though there is so little energy left for the fight. The lights above have become bulls-eyes and a dart is imbedded in one of them. 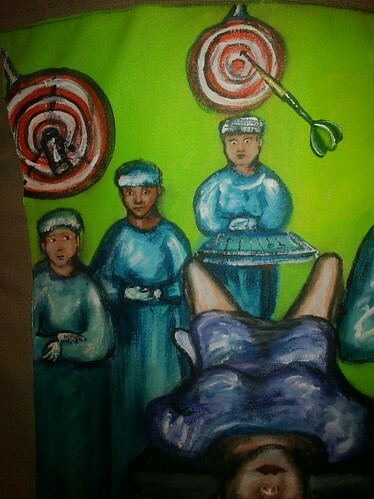 Below the dart, a medical practitioner stands behind a tray of tools. His eyes are shocked and staring at the gushing blood. Beside him stands another man, who seems to swallow in disbelief. Beside him stands the woman, who eyes dart to the side as if laying blame upon the tall man to the right. To the right the surgeon stands. His arms are crossed defensively and he stares with uncertainty into space. 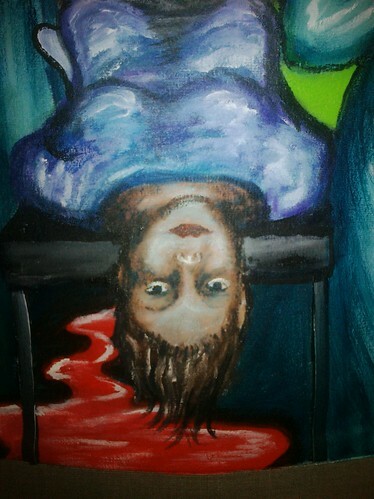 And anchoring the red bulls-eyes on the ceiling into the composition, the floor pools with blood. And this blood is so bright, so present; it almost forms another player in the scene. 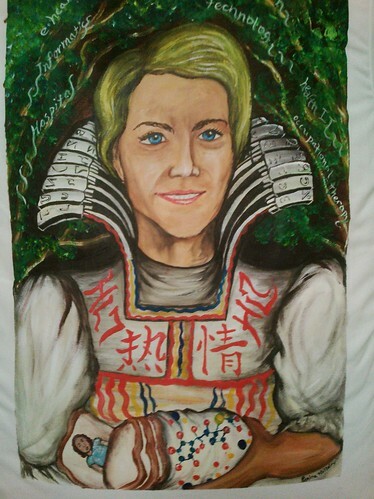 I dare you to make sense of this painting if you took the eyes away. If those little blobs of white and dark were gone would this be the same tale? The eye is a window to the soul. I looked within and I saw Near Miss Mom. 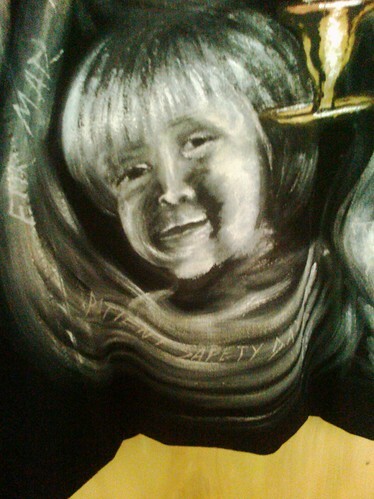 And at The Walking Gallery I held her in my arms. As our eyes filled with tears, I could tell… I had gotten her eyes just right. 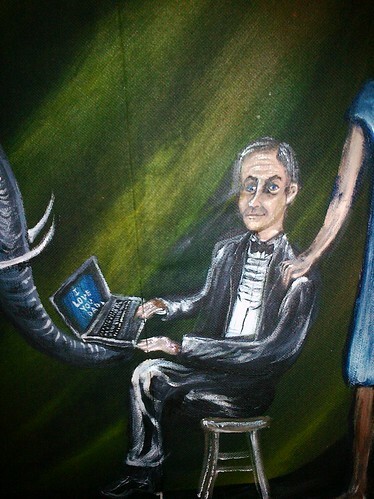 On June 1st, 2011 just days shy of the Walking Gallery, I flew out the Kansas City to perform a speech before 650 developers/programmers who work for Cerner. I even painted two jackets in my hotel room while preparing for my speech. This would be my third speech presented before the staff and clients of Cerner. I had been invited to deliver my first Cerner speech at a Meaningful Use Summit on the Cerner Campus by Roy Foster in Kansas City, Missouri exactly a year before. The Cerner Campus amazed me. It was designed to visually combine elements of art, medicine and technology. 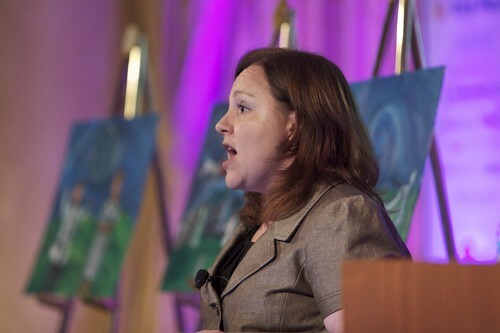 My Cerner speech was the first keynote speech I ever gave. It was the first time I designed my own power point. It was the first time I flew out of state to give a speech. And it was the first time I met Clay Patterson. I vividly remember meeting Clay. He was introduced to me as an excellent IT professional working on new programs within Cerner. We shook hands and he began to explain his ideas. He gestured with animation at the display screen, his boyish good looks and the sparkle in his eye made me feel at times as though I was speaking to a middle school student after winning the big game rather than a most successful under-40 Kansas City businessman. I got to speak to him quite a bit about the ideas he had and how they could change the future of patient care. I had recently discovered the differences between a legacy EMR and a cloud-based provider. I intently listened to Clay engaged by his explanation of Cerner. I also learned that Clay was a scion: his father Neal Patterson was CEO of Cerner. Most importantly, I learned that Clay’s deep dedication to the patient perspective in electronic medical records sprang from a wellspring of love. Clay’s step-mother has cancer. 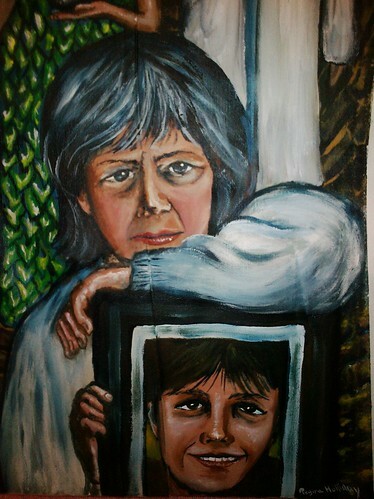 I would explain this painting at the different locations in which it has been shown. I would say Clay Patterson from Cerner is in the picture. HIT people in the know would often correct me, “ You must mean Neal Patterson.” No, I would say. 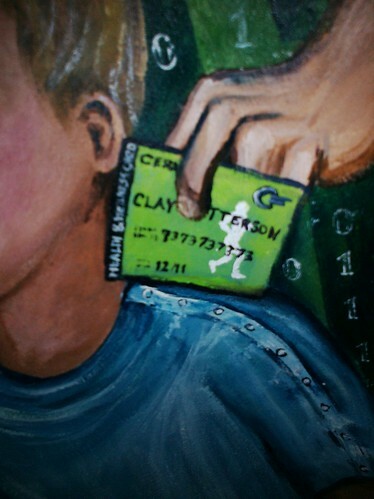 I mean Clay Patterson, the son. 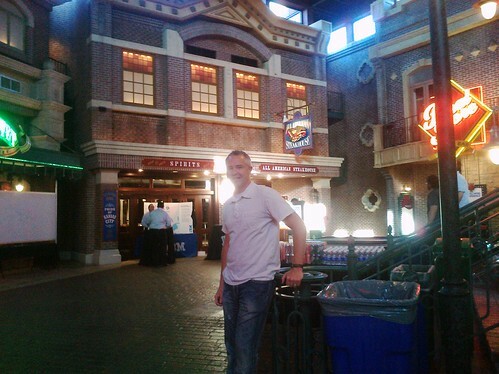 I was invited once again to speak before Cerner in early October 2010. I flew back to Kansas City and presented as the member of a panel of speakers as part of the Cerner Annual Conference in Kansas City. I normally dress in black dresses with a conservative blazer. But at this event, I wore the brightest shade pumpkin orange. I felt sort of conspicuous, but thought it is October. When I arrived at the event I was amazed to see that same shade of orange everywhere! 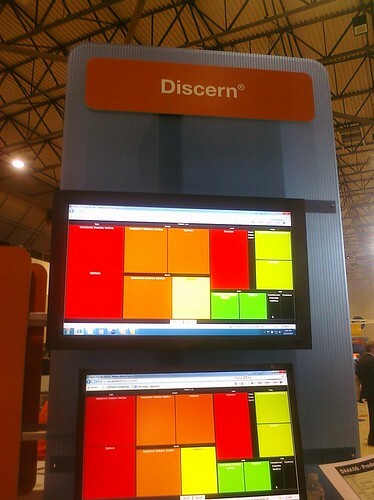 Every member of the Cerner teams in every booth of the exhibition floor was wearing that exact same shade. Clay‘s team asked me how I knew to dress in “the color of the day?” I blushed, and told them I just felt that I was supposed to wear this color. 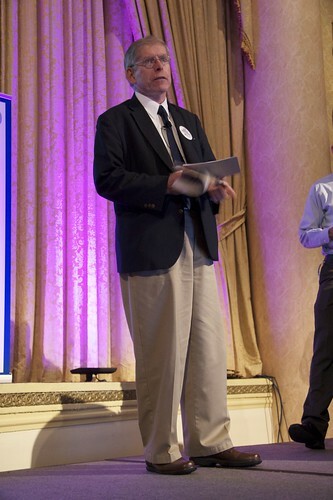 And finally, I was back in Kansas City in June 2011, to speak yet again. In the months between I kept in contact with Clay during a series of emails and tweets. And I was so happy to have dinner with Clay, Scott Ackerson and Brian Carter. It was a brilliant and freewheeling conversation in which the seeds of a painting were planted. 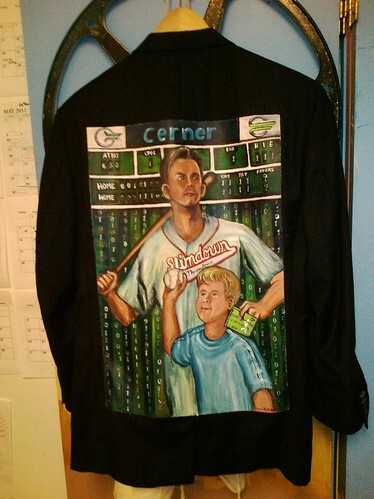 And from that conversation and my trips to Cerner a jacket painting was created. This is Play Ball: Clay Patterson’s Jacket. 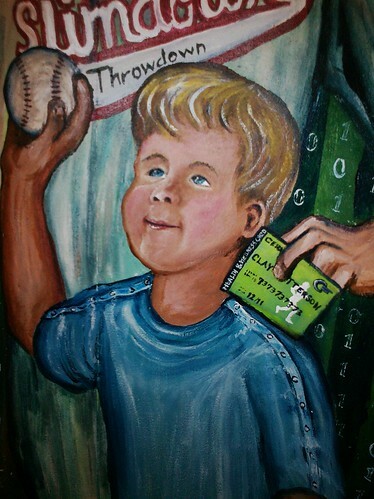 In this painting Clay is no longer the young man of the Menu Set. He is no longer smiling in good humor, while being ignored by two clinicians. He is now an adult confident leader, ready to play ball. He holds his bat in a nonchalant fashion over his shoulder as his far-seeing eyes gaze into the distance. You see Cerner may only be an EMR company, but within their company they created a healthy living initiative tied into their patient portal and electronic health record. It is called the Slimdown Throwdown. It is crisp baseball themed website design brought to you by Scott Ackerson’s design group in Cerner. Within the competition employee teams compete against each other in a physician reported weight-loss challenge. The winning team is awarded an all expenses paid vacation. This web and EHR supported competition will soon be able to leave the confines of Cerner and create health challenges through out Kansas City. 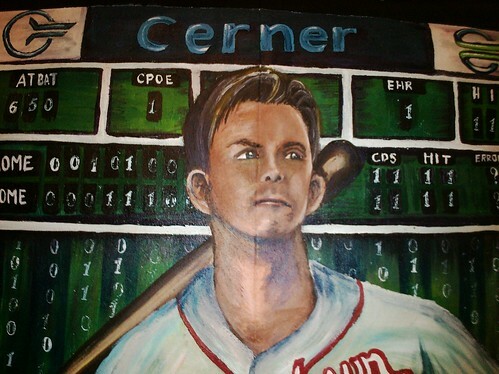 In Clay’s other hand he holds the Cerner Health and Wellness Card. We spoke quite a bit about this card at dinner as Brian fished his out of his pocket and told me to try it out. I am familiar with such cards. They are used by many systems in Europe and some in the US to allow for ease of check in and payment. But Brian explained this card also functioned as a first responder emergency card. He encouraged me to flip-over the card and use my smart phone to bring up his record. I couldn’t believe it. Within moments I was looking at any information that Brian Carter had wanted a first responder who was treating him to see immediately. It was amazing. Behind Clay there is a scoreboard. Now things get really interesting. There are 650 at bat representing the developers who saw my speech. The traditional scoring fields have been replaced by CPOE, EHR, HIE, CDS and HIT. The scores are filled with a continual chain of ones and zeros. This is a binary scoreboard and beneath the scoreboard an infinite stream of Matrix-like code descends. One of the only scoring fields that remain from a traditional board is that of errors. But that field is answered with a question mark, as we do not know the extent of errors with medicals records that remain opaque to patients. There are two teams at the Cerner field and they are both called home. If you look above, this dichotomy of form is repeated. On the left is the old Cerner logo, with all of its corporate angular harshness. On the right it the new Cerner logo billowing out like a ribbon of welcome. This is a time of change of within Cerner. They have issued a throw down challenge at themselves. I am very interested to see what weight shall be jettisoned in the days and months ahead as each team fights for its dream. I presented my speech at Cerner in the Cerner continuing educational facility on the Riverfront property and former address of Sam’s Town Casino in North Kansas City. Before entering the building, I was inspired the echoing silence of the large empty parking garage: a space designed for a riverboat that was no longer there. I felt the powerful ripples in time as an empty Cerner parking lot reflected the potential energy of those who were not there in person but were very much present online. That potential energy has power to change way we do medicine and view patient participation within electronic health records. And within an hour I had another first due to giving a speech at Cerner. I was trending on Twitter. 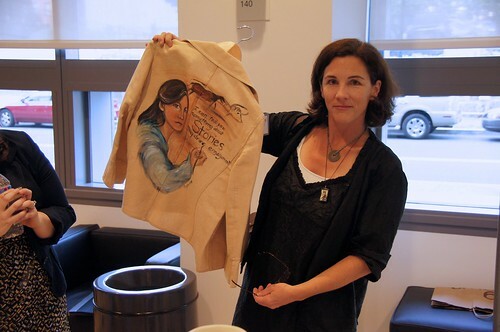 I was so happy to present, and overjoyed that Clay gave me his jacket to paint. When he gave his jacket to me I told him how much I loved the facility. I said I could see it as a Kansas City technology Hub, I could see it as the home of Health 2.0 Kansas City. I could see it as a children’s museum focusing on the intersection of electronic health records and mobile health. 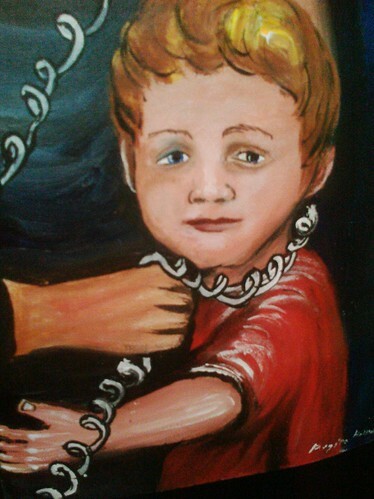 Perfectly designed for the young boy depicted in this painting. Think Kaiser Center for Total Health, but even cooler, with more neon lighting and some music from Tron. But I see with new eyes. I see what can be without old prejudice. When I look at Cerner I don’t see an old legacy EMR system. I see a future cloud/ legacy composite that could save lives. I see the shedding of a logo that was more about corporate power and less about sharing. I see a company that has invited me: Little Miss A-type, the painting activist, the one who tells it as she sees it. They have invited me to speak three times before thousands of people. And when I see Clay Patterson, I don’t just see a scion. I see a man ready to play ball. What Can You Do By Next Tuesday?